With the new game, you can take your Sims for a dinner to any pre-made restaurant, or you can make it from scratch for yourself. It could be drilling a hole in the wall, or placing aquariums and tables, etc. 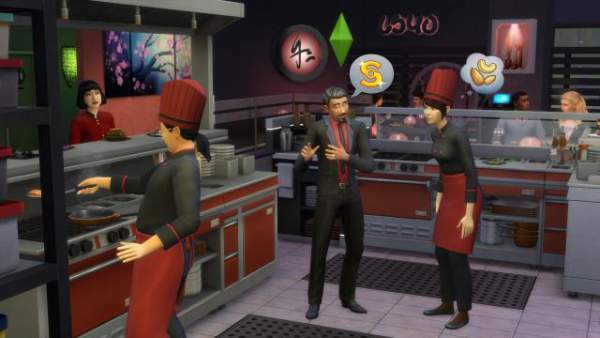 One of your own Sims can own and run the restaurant. You can build a franchise of your own restaurants. Moreover, you can hire employees and can have 100 percent control over the hotel. But, you can’ take control on the role of chef yourself. Apart from chefing, you will have the following features. Some waiters can drop the food. Eat dinner in outdoor dining areas. Sims order their own drinks and manually pay for their meal. Children can color at the table before they eat. Sims can take pictures of their food to save to their inventory and decorate with. If you’re eating dinner with a group, make a toast with everyone like in The Sims 2. Warm your hands near a heat lamp if it’s cold outside. Is the food terrible? Your Sims’ reaction will tell all. Drink still, or even sparkling water. A host will greet you at the door and bring you to your table. Watch the cooks make your food. Celebrate birthdays at the table. Enjoy the view of all-glass aquariums in the dining room. Drink nectar (wine) in an exclusive new glasses. Choose your own wait staff uniforms. Make sure your restaurant is up to snuff because you may run into a food critic. No need Get To Work to own a restaurant. A lot more features are yet to come like all new build/buy objects, clothing, accessories, and hairstyles. In the trailer, an outdoor heat lamp, chandeliers, decorations, windows, and new wallpapers are easily visible. The confirmation regarding the types of restaurants, experiment foods, and careers are yet to come. This time, the developers have added a variety of new desserts, sushi, soup, cheese plate, octopus, etc. The last sentence of EA’ official press release states that the users will be able to dive deep into the sausage preparation shortly. There are a lot more things for us waiting around the corner. It will be interesting to see if Sims can skip out the bills or they would have to clean dishes if they get caught. Sims are making a reservation, using sinstagram for sharing food pics, fast casual restaurants are some of its features. Watch the trailer and see the pics get more idea about it. What more features do you expect to have in it? Let’s know via comments. The Sims 4 Release Date, News & Updates: Latest DLC Expected in November 2016?